Thiruvananthapuram : Cuba has expressed interest in cooperating with Kerala in various sectors, including health, sports and tourism. This was stated by the Cuban Ambassador to India Martinez Oscar I Cordoves during a meeting with Kerala Chief Minister Pinarayi Vijayan in New Delhi yesterday, an official release said here today. 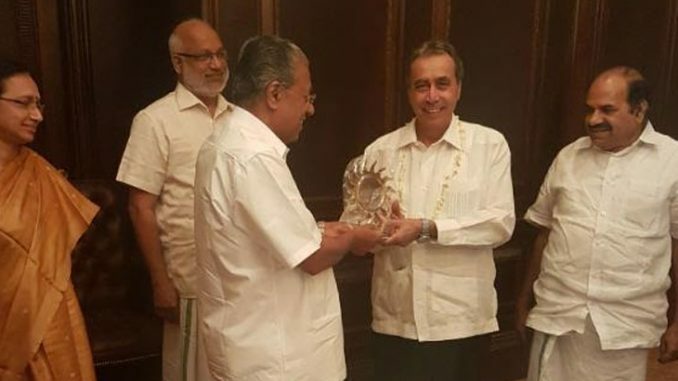 Vijayan and Cordoves held discussion on the possibility of Kerala utilising Cuba’s expertise in the health sector. The possibility of sending doctors and sportspersons from Kerala to Cuba for training also came up during the meeting, the release said. Cordoves said that his country was ready to import spices like pepper and cardamom directly from Kerala if the Indian government accorded permission. State Chief Secretary Nalini Netto, CPI-M State secretary Kodiyerai Balakrishnan and party politburo member M A Baby were among those present during the meeting.